Budgeting your money is very important. We live in an era where subscription services are common. You have the usual array of rent and utilities to pay. Plus, money these days is a little tighter than it used to be comparatively speaking. Balancing a checkbook is dead, but there are apps that do basically the same thing much faster and more efficiently. Here are the best budget apps for money management (on Android)! What do budget apps do? There are two main types of budget apps. The first is an expense tracker. This is mostly used by people who deduct a lot of stuff from their taxes. Business owners who travel a lot, bloggers like us, truckers keeping track of meals and miles driven, and all sorts of other professionals use expense trackers. This lets you know how much money you spend on all the stuff you need for your job (and life). You then have all the info you need when tax season rears its ugly head. The other style of budget app is the one you’re probably thinking of. It keeps track of your bank budget, your expenses, bills, utilities, and other such things. These are useful for keeping track of where your money goes so that you lose less of it. They are especially helpful for folks who manage multiple accounts at once and pay a lot of their bills online. Here are more app lists to help you put money in your pocket! AndroMoney is one of the most popular and successful expense trackers on Google Play. The app offers cross-platform support for the web and iOS as well. Some of the features include multiple accounts, support for account balances and transfers, budgeting functions, support for multiple currencies, and backing up to Excel if needed. The design is surprisingly clean and the analytics are laid out in a logical and easy-to-read manner. We also love that this is a free app. There are ads, but it's hard to maintain a budget when you're spending a hundred dollars a year on a subscription option. In any case, there isn't a whole lot wrong with this app. It seems to work quite well. Financial Calculators is a vital tool when figuring out your budget for the future. The app is essentially a collection of calculators that can help you figure out various things. For instance, it has a loan calculator so you can see what your payments and interest will be like. This app has around three or four dozen calculators in total that range from home buying to fixed vs adjustable rate and even a return-on-investment calculator. It won't manage your money, but it'll help you make fewer bad decisions on upcoming purchases. It's one of the must-have budget apps. Short of getting a piece of paper and writing it down, using a spreadsheet is about as old school as it gets. Google Sheets and similar apps work very well as budget apps. 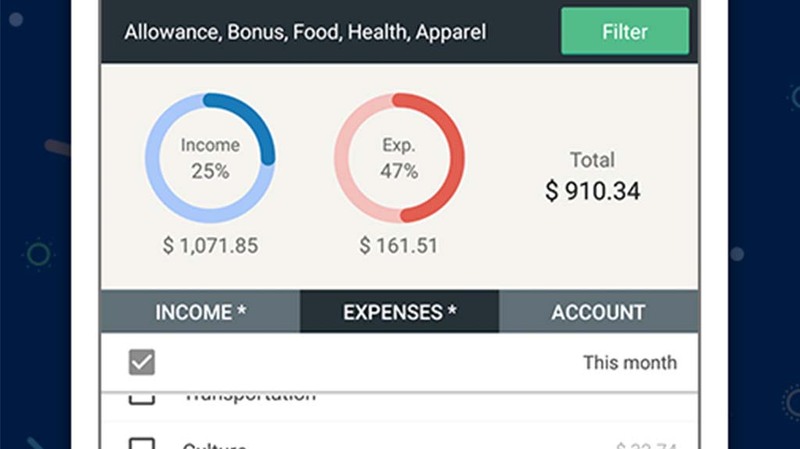 Simply fill in the cells with your income, expenses, and other data. You can then see what you make and spend every month. Google Sheets is completely free so we'll recommend that one. However, pretty much any office app (with spreadsheets) or spreadsheet app will do the trick. It's old school, but it's also much simpler. It's a good option for those who are highly security conscious. Mint is actually a replacement for an older app called Mint Bills. Both are developed by Intuit, the same company that does TurboTax. This one has a lot of features. You can see everything in one place, manage your bills and money, and even pay your bills if you want to. It will also provide your credit score, remind you of upcoming bill payments, multi-factor authentication (for security), and a web app that you can use. Some are lamenting the death of Mint Bill. It received a lot of one-star reviews as a result. However, it seems to have rebounded. Monefy is one of the more simple budget apps. Its claim to fame is how quick it is to use. The app tries to set itself up in a way that makes adding new data quickly and easily. It usually does a pretty a decent job. Alongside that, you'll get various currency support, a built-in calculator, passcode protection, Dropbox integration, widgets, and more. The interface takes a moment to learn. However, once you get into using the app, it really is easy. You can pick up the free version using the link above and the pro version costs $2.50. My Budget Book is a serious app. It features all kinds of fine details and allows you to set limits by category. Thus, you can decide how much to spend on cloths, entertainment, etc. Additionally, it features 100% offline support, no ads, no in-app purchases, and a themed, Material Design interface. The entire thing is highly customizable and that makes it powerful. You can also export to HTML or CSV. It doesn't have common advanced features like cross-platform support, but it doesn't really need it. The only downside is that you'll have to pay for this one up front. My Finances is one of the better budget apps. On top of the common stuff, you'll be able to manage multiple accounts, plan for future expenses, and even view a complete history of your actions. It's wrapped up in a colorful, Material Design interface. It's customizable and allows for repetitive expenses (like bills). That means it takes a little while to set up but it should track just about everything. Additionally, the app is still very much in development. The devs have already promised things like cross-device syncing in future updates. Wallet is an app with a mission. It aims to help you bring your tumultuous financial situation under control as quickly as possible. Like many, it syncs your balance and transactions with your actual bank. It also features account sharing so you can share with your significant other, accountant, or whatever. It also supports multiple currencies, cloud syncing, warranty tracking, templates, shopping lists, and it can export to a variety of file types. It's all done up with a Material Design interface. It's worth a look at least. Your banking app is actually a pretty decent budget app as well. You can view your balance, recent transactions, pay bills online, transfer money, and more. Some banks have more features than others. However, they all usually get the basics right. Those who only need basic budgeting tools can usually make do with just their banking app. Many credit card companies also have official apps and you can use those much like banking apps. Official banking apps also usually have auto-pay for your bills, the ability to download bank statements, and other stuff you may need, especially curing tax season. Seriously, thank you for reading. If we missed any of the best budget apps, tell us about them in the comments! To see our complete list of best app lists, click here.